Built in a Renaissance style in the late 16th century and rebuilt in a baroque style 200 years later, the Freemasons once lodged here until their order was dissolved under Emperor Josef II. Zwettl is off the beaten tourist path, and that’s good news for those who want to enjoy a typical Austrian small town experience. Located in the Waldviertel, or a forest district of Lower Austria, you’ll find hills and meadows dotted by the ruins of castles, palaces, and abbeys. Zwettl is about 130 km. northwest of Vienna, where routes B-36 and B-38 intersect. Trains from Vienna leave from Franz Josef Haupbahnhof, and you must change at Schwarzenau. The hotel runs a shuttle to the train station. Buses also reach Zwettl. 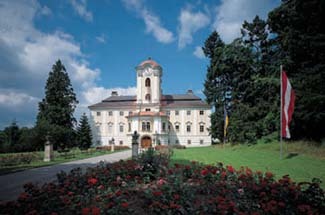 Schloss Rosenau is one of those special places that is half museum and half hotel. A reception desk just through the entryway serves both functions. Even if you come only to visit the museum, take time to enjoy a lunch outside on the terrace with a view that extends across the meadow to a small lake. Just near the front entrance is a charming rural dining room with built-in benches. Some guest rooms overlook the lake and meadow and are decorated in white-washed walls with either pine furniture or antique beds. As befits its name, rose gardens highlight the grounds.